If you love what Sagres is all about, then you will feel as much at home here as we do! 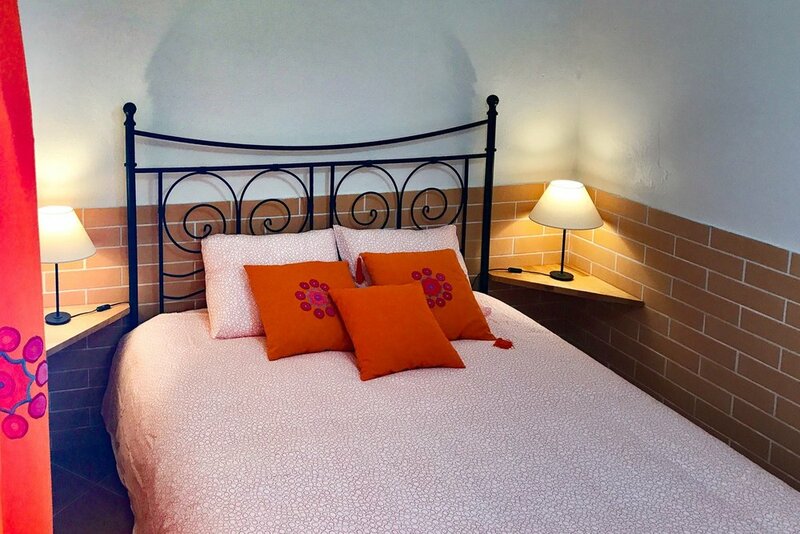 Located in a quiet but central area of the Village, our two bedroom house with large sunny patios and private parking, was formerly a typical fisherman’s home, which we have fully refurbished to include all the home comforts one could ask. The property is fitted with modern appliances, however the traditional style of the house has been maintained to create a very spacious, bright and functional holiday home. 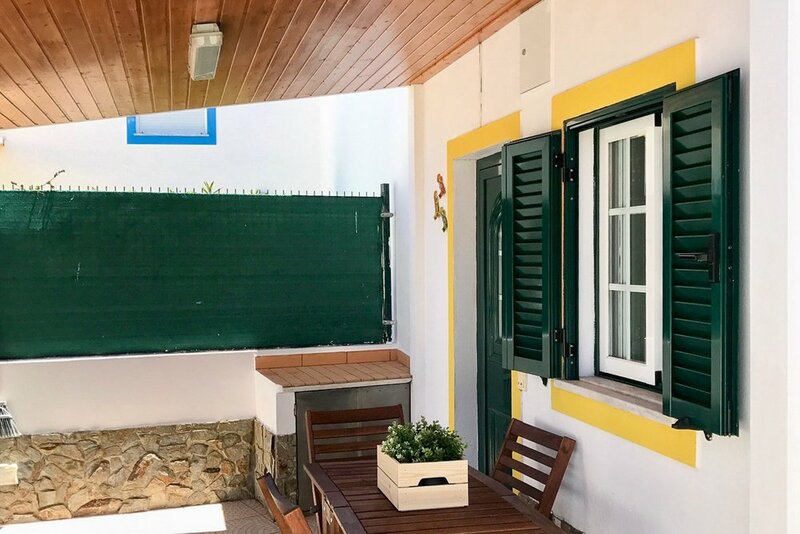 Beautifully furnished and equipped, our Sagres House has two double bedrooms with a total of 5 beds, one bathroom, one toilet room and two very large sunny patios/ garden with private parking. The entire area of the house is fenced and secured and property is accessed via a green gate which leads into a large entrance, where there is space to park a car. There is an outside shower area perfect for cleaning wetsuits and boards. Also outside, there is a covered area in front of the kitchen ideal for breakfast and afternoon relaxation. Once you enter the house, a fully fitted kitchen is equipped with everything guests need for a comfortable and enjoyable stay. On the ground floor there is also a bedroom with a queen size bed and a shower room. The large, open plan lounge/ dining area (for 6), includes Cable TV, sofa (that can be converted to double bed) and leads out onto a very large patio/ garden with a beautiful lemon tree. On the first floor there is an open plan room with two single beds on one side and two single beds on the other. A discrete and convenient toilet room separates the two areas and provides privacy. From our lovely neighbours, to the best fish restaurant you can try in Sagres - just 5 minutes’ walk - our home is a beautiful place and we welcome guests who are ready to make this their special place too. Towels and bed linen is provided, as well as shower amenities. We are always available for assistance to ensure guests have a stress free and enjoyable experience. "Schön eingerichtetes Haus mit hübscher Terasse. Entspricht voll und ganz den Bildern. Der nächste Strand ist in 20 min zu Fuß zu erreichen. Sehr viele schöne Strände in der Umgebung, deshalb empfiehlt sich ein Auto. Hernani hat tolle Tipps gegeben, was wir ansehen sollten. In Sagres war immer sehr viel kühler Wind, insbesondere am Abend. Da war es schön so ein gemütliches Haus zu haben. Ein toller Platz, wo wir auch bei einem zweiten Besuch viel Neues entdecken würden. Vielen Dank!" "We really loved our time in Sagres at your place!." "Three friends and I rented Alda and Hernani's place for a surf vacation in Sagres. The place had exactly what we needed: there was enough space for the van and the boards in the carport, an outside shower for cleaning the boards and wetsuits, and two clothes lines in the garden. The space was also great since there were three beds and an air mattress upstairs (with a small partition separating one of the beds from the others for some privacy), two toilets, a big kitchen, and two eating spaces in the dining room and the beautiful garden. The location was fantastic since we could walk to a good restaurant (Oliveirinha) in five minutes and drive to the supermarket, surf schools, other restaurants, Tonel, Mareta, and Beliche beaches in 5-10 minutes. Since the place is right off the main road in Sagres, it was also a straight shot to Cordoama, Castelejo, Amado, and Arrifana. Alda and Hernani were great with communication from the beginning and even met us at the airport to make check-in easier. I'd definitely stay here again. Thanks so much, Alda and Hernani! We really loved our time in Sagres at your place!" "Alles sehr schön! wir empfehlen das haus gerne weiter." ein sehr hübsches haus, sehr nett und ruhig gelegen. schlüsselübergane funktionierte -trotz 3std. flug-verspätung- unkompliziert und nett. Hernâni war jederzeit gut erreichbar und stand mit netten tipps und hilfe jederzeit zur verfügung. kurzum: alles sehr schön! wir empfehlen das haus gerne weiter. Your holiday experience in the Algarve is waiting. Contact us today for advise and availability. We look forward to hearing from you!